Canadian Immigration – 7,500 Invitations to Apply issued in June! This month has seen two Express Entry draws invite a total of 7,500 candidates to apply for Canadian permanent residence, making it the busiest June since Canada introduced the Express Entry system in 2015. 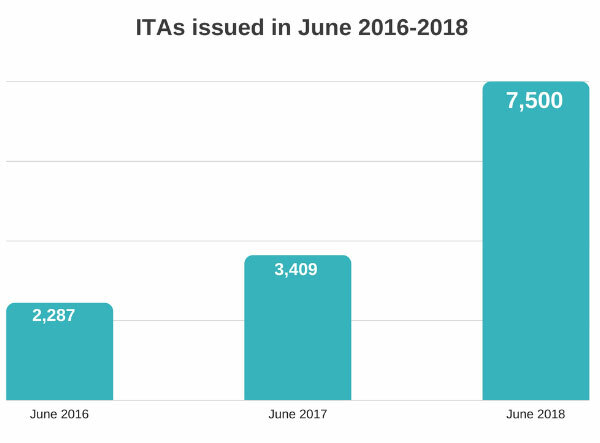 Immigration, Refugees and Citizenship Canada (IRCC) issued 3,750 Invitations to Apply, or ITAs, in each of the two all-program draws held in June — the largest invitation rounds yet in 2018. IRCC recently added two factors with the boost in score points which suggests that the score will remain low and may drop even from the present score of 442 points. The federal government is continuously increasing the number of Invitations to Apply (ITA) and it is possible that the number reach up to 4,000 in a single draw. It is clear that the Canadian government wishes to keep the Express Entry system as the main pathway for economic immigration to Canada. It is best to apply for Canada PR status apply through Express Entry as it is by far the most flexible option. A candidate is able to mention the desired province too, such as Saskatchewan, Nova Scotia, and Ontario etc. to get direct nomination from a province. If your Score is less than 442 CRS, you can wait for the next Express Entry draw or better can easily apply through PNP- Canada Provincial Nominee Prgram is one of the fastest ways to obtain a Permanent Resident Visa status. CHECK YOUR ELIGIBILITY AND START YOUR PROCESS NOW!